It all started about 3 months ago. I was walking home from the hospital and two young boys said they were hungry and wanted food. I didn’t have any with me, so I invited them over for dinner. They were filthy, so I offered them a shower while I warmed up dinner. They came out of the bathroom dripping wet with their clothes back on. They had never used a towel and didn’t know what to do with the one I gave them, so it sat folded on the floor. A few days later, two women on the street asked for food, so I brought them home with me. It was pretty interesting. I don’t think they had been in anything but a hut before. They were not comfortable coming into my house or sitting at the table, so we sat on the cement floor next to the table and ate. I felt so blessed by these people I started looking for them. One night on my way home, I came across some of the street boys, six to be exact. I invited them over for dinner. I didn’t have dinner ready, so I started cooking. One of the boys had been over previously and he asked if they could all shower. Next thing I know, all 6 boys are in the shower. I offered to wash their clothes, so we threw them in the washing machine. I obviously wasn’t thinking too far in advance, because I do NOT have a dryer…. and it was the rainy season. So, they all got to wear, yep, my clothes. Now for those of you that do not know me, I am not exactly petite. And these boys were all 9-12 or so years old. I wish I had taken a picture of them all. Scrubs, sweat pants, sweaters, t-shirts to their ankles, bare shoulders from the neck of a sweat shirt… They were quite the site. When they finished with their showers, I put in a movie for them to watch. We all got on the couches and I attempted to translate part of the movie into Amharic and then one of the boys that spoke Amharic would translate it to Wollaitina. We eventually ate dinner and did the laundry. In this time, I found out bits and pieces of their lives. It is hard when their primary language is Wollaitina. I just don’t know enough to be able to talk to them. I cannot tell you how hard it was to send these kids back to the street that night. Then next day, I was checking to see if their clothes were dry and I noticed they all had a bunch of “fuzzies” on them. With closer inspection I realized that they were completely infested with body lice. I spent the next few hours picking the lice off their clothes. I finally just gave up. The clothes were INFESTED, thousands of bugs. I decided to shower and got the heebie geebies when I found the lice crawling on my clothes. I took a deep breath, read some about body lice and decided I was bigger than body lice and could get over it. In my reading, it said that if you have access to washing your clothes once a week, you should not be infested with lice, so the weekly dinners began. Most weeks there are 10 or 12 boys and I am learning more and more about them. Every week starts with showers and clean clothes; then we eat, play games, watch movies or just talk, “aka stare at each other and try to say things”. Some of the boys come back from week to week. This week I only knew one of the ten. Most of them have one set of clothes. I have done some shopping in town, so now when they come over they don’t leave in my clothes. Well, that isn’t entirely true. I haven’t found enough clothes for all of them, so some of them wear my clothes. But the rules are: you come in with one set of clothes, so you leave with one set of clothes. The next week they can get their clean, lice free, dry clothes back. Now, I would like to introduce you to some of my new friends. Abiti is 11 years old. His mom left. He doesn’t know where she went, but says she went a long ways away. He hasn’t seen her in years. His dad and only sister both died. He lived in a small village outside of here, so he came to Soddo for a better life. And he says it is much better because “there is food”. He is wearing a sweater that has been sewn to pseudo fit him and is falling apart. He got a t-shirt from me that goes down to his ankles. And his pants only go down to his calves. His smile is amazing! Just today I saw him on my way to work and he ran to me and gave me a big smile and hug. He then showed me where he sleeps. is that they essentially become the slaves to the family. He has three siblings and he is the oldest. He said that living in the country was hard. He said there was no food, so he came to Soddo. He told me he begs or works and is able to make about 25-35 cents a day. 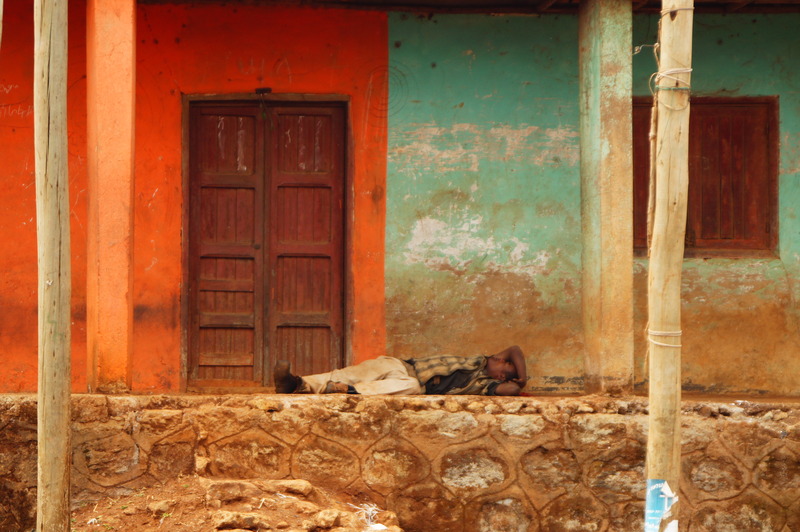 He pays a family six cents a night so he can sleep on their porch. And then the rest he can use to buy food. This is how you get “ambushed” at the market with “helpers”. I don’t know anyone in this picture. Today, I am asking for you to pray for these boys. I would like to help them get into school. Their is a church that has a ministry for the street boys, so I am going to contact them. Hopefully, they have something set up. My house helper has taken over the duties of cooking and clothes washing. I don’t know the best way to help these boys, but I am going to love them, feed them, let them shower and wash their clothes. What a kind thing to do for these poor kids. They must think of you as their own personal angel. You are quite the girl Doc. These people are truly blessed to have you. Stephanie, Will you post how to help the boys here on your blog or on fb? Can we send you clothes? Or shoes? Or, perhaps tell us how to help you with the boys? I will post as soon as I get more info. At this time feeding, washing and loving on them is all I am doing. Clothes and shoes are cheap here, it is just a matter of getting to the market and buying them. I can probably buy an entire outfit and shoes for $10 to $15. Not great clothes or shoes, but something to keep them warm. Because of how they live their clothes are ruined pretty quick. I will post something soon. Steph…in a situation like this, would giving you money for food and clothing help? I imagine many of your friends (including us) would be glad to financially help. We will add these boys to our prayers, and continue to lift you up in prayers as well. I look forward to your “ramblings” as you have called them. Your writing allows us to get a very small picture of what your days are like. I’m sure you know from your mom that Ron is staying with us for a while. He is working on Ellen and Vernons house that was allowed to get into a serious state of disrepair. I think he has a huge project ahead of him, but he is tackling it one step at a time. I imagine the time away from your mom also makes the time less enjoyable but he’s committed to the project. You tell us how… and we’ll be happy to help!!! Stephanie, I really enjoy your updates and don’t ever take time to reply back to you. I can only imagine how much these boys love what you do for them. You’re such a giving and caring person. Thanks for sharing. I would love to help in any way I can. Just let me know. My husband wants to know if it is possible to send money to buy you a dryer…? 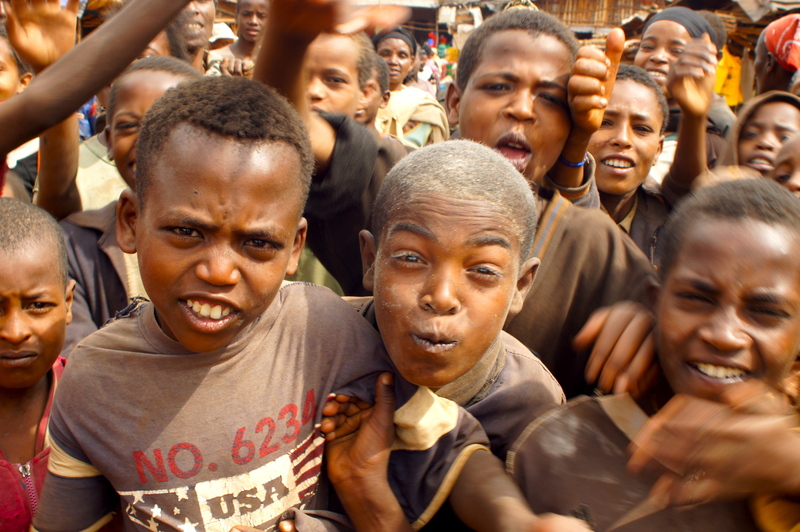 Although, we did not see one dryer in Ethiopia both times we were there…..
That is so kind of you to take on these boys and help them the best way you can. I love you! let us know if there’s anything we can help you with. Shannon, I sent you an email, so you have my address. If you didn’t get it please let me know. The boys come on Tuesdays. Even if it isn’t the Ekeziel I know, I can ask the boys if they recognize him with a pic. I was doing some reading and it is estimated that there are over 2000 street kids just in Soddo. I haven’t met most, obviously, but my guess is they know each other pretty well. If anyone can conquer the plight of the street kids in Soddo it’s you. You are the most loving person I know and I admire you more than you will ever know. Keep us posted on how we can help. Stephanie: I knew your dad, and aunts, when they lived in Baton Rouge, many moons ago. In fact, Denise is one of my best friends, still. I see your updates, via your dad’s FB postings. I just signed up to receive your postings, via e-mail. I think what you are doing is remarkable, and heart-wrenching, at the same time. You have God’s strength to guide you, and what you are doing at the hospital, and for these boys is inspiring, to say the least. Thank you for being the voice and hand of God in this area, which is obviously suffering!! You are more than welcome to send donations to buy clothes for the boys. My house helper is going to the market tomorrow to find clothes for them. She told me that shirts, pant and shoes cost about $3 each. I contacted a program that helps get the kids back into school and I will be meeting with him the beginning of Oct. to discuss how we can work together. i also have spoken with a peace corp volunteer who is working in the school system to see what is required of the kids (pens, paper, shoes, uniforms….) to get into school. I really think that will be the key for their future. To send money you go to the right of the blog. It has a how to give via snail mail and how to give online. THANK YOU!!! As soon as I meet with the organization and find out the school stuff I will post a blog on how people can help with these kiddos. you are doing amazing work through God. Please, let us in the states know how we can help. I love you stepganie hail- you are amazing. Thank You for what you are doing for the boys Stephanie. As a person who is born in Ethiopia, I came to remember the ordeals of the kids just like you mentioned it. It pains me to see no development even since I was a kid. As I am hearing, things even gets worse with inflation and bad economic prospects. As you asked I will continue to pray for those childrens and hope to see a better day for my country. Thank you Yadesa! And if you have any suggestions, please let me know. I would love for the problem to shrink, not just take care of what I can. Thank you for sharing the lives of these boys. These are not just stories, they are the realities of millions. Your stunning words have left me with a … fire. Thank you. Stephanie – those boys are blessed to have you. I’m sure just giving them any attention is hugely helpful to each of them. I cracked up picturing them in your sweats and scrubs! God bless your work there and the simple gestures you are doing to change lives! STEPHANIE, YOU ARE THE HAND OF GOD. THE MAKER OF HEAVEN AND EARTH BLESS YOU SO MUCH! !